A good overview of the Smalltalk Language can be found on Wikipedia. 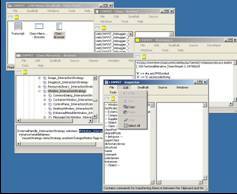 LSWVST uses native Widgets, which are availabe in LSWVST Orthogonality. Please read our differences to VSE Page . If you plan to migrate a legacy VSE application, you should visit the VSE migration page. a few sub directories ( Libraries / Repositories / Images / Virtual-Machines ). Double-clicking Lswvst-dev.exe will bring up LSWVST's development environment. LSWVST TinyDev brings you back to the 80ies, a Class-Hierarchy-Browser, a Class-Browser a Workspace, a Transcript a Message-Browser and a Debugger-Window. For small programs and educational purposes this is enough. 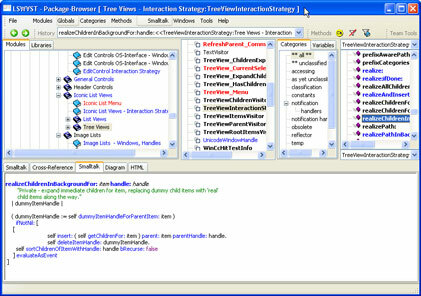 LSWVST Team-Environment is what you need to develop LSWVST-programs.Your main Browser is the Package-Browser. depending on Program-Type you target ( Executable / DLL / Driver ) saving your *.osf files into the right Virtual-Machine File. It is not recommended - but possible to use an image-file for production. Image-Files represent "Snapshots" of the Object-World during development and should not be abused to save some initialization-coding. the resulting executable is about 11 KByte. ( HelloworldMessageBox forOwner: self desktopWindow ) createWindow. create the Base ObjectSpace by invoking Build ObjectSpace on your Helloworld cluster. invoke the Build-Executable wizard which combines a Smalltalk-Runtime exe with the Objectspace-File. the resulting executable is about 30 KByte.